Owners of a disused Cornwall tin mine face a battle to reopen the site. Owners Baseresult submitted plans to Kerrier District Council on Thursday to restart mining at South Crofty and build hundreds of houses on the site. But the government-funded body whose job is to regenerate the area dismissed the plan and announced it will acquire the site either through a deal or by compulsory purchase. The Camborne Pool Redruth Regeneration Company says the proposals are not suitable. There was also a sceptical reaction from former miners and local councillors. 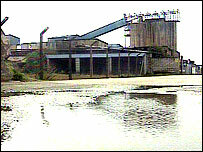 The closure of the mine in 1998 ended a 3,000-year-old tin mining tradition in Cornwall. Baseresult's managing director, Kevin Williams, said new mining methods would reduce the cost of tin production. Mr Williams said the processing plant would be built 100 metres below ground. "By doing processing underground not only do we take away from the surface all the noise and dust, we don't actually have to bring all the rock up to surface either," he said. The company says that will free up the surface of the site for housing and commercial and leisure developments. Baseresult says its plans are in line with the aims of the Camborne Pool Redruth Regeneration Company. But some critics believe Baseresult's main interest is the potentially lucrative housing development. One Kerrier councillor, Graham Hicks, said: "Frankly I do not believe that you can economically run that anymore. "I wonder if there is a hidden agenda, I hope I'm wrong but I can't see that mine ever economically going back into production again." Falmouth and Camborne MP Candy Atherton welcomed the urban regeneration company's announcement. She said: "If it was a concrete proposal for genuine mining then I think people would jump on board, but I think it would be far to call it a hobby-horse mine and we don't want that. "We want quality jobs in the community."